While many businesses globally run SAP software, the cost and complexity of software licensing can be significant. 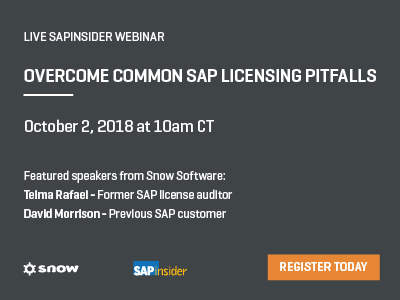 In Snow Software’s upcoming live webinar with SAPinsider, you’ll hear from two different perspectives — a former SAP license auditor and a previous SAP customer — on what maintaining SAP licensing entails. A live Q&A discussion will follow the opening remarks. Sign up for the webinar on October 2nd at 10am CT!